There’s a moment early on in “Guardians of the Galaxy Vol. 2” when the camera loses sight of a fight between the heroes and a slimy villain, opting instead to focus on Baby Groot (voiced by Vin Diesel) dancing energetically near a portable stereo just beyond the main action. Music plays an integral part of the tone of these films, but so does the direct humor of its characters – a gathering of colorful and offbeat men, women and creatures that are charged with the protection of life in a plethora of space-bound danger zones. For the audience, it’s almost customary to assume that the humorous details will win out over the doom of a big moment. But what about those of us who want to see more of the exchange in a conflict that will ultimately pave the way for the film’s story? Is little Groot’s distraction – amusing as it is – worth that sacrifice? However you feel about the shift will come down to what you expect out of the material. For all its innocence, that moment underscores the attitude of filmmakers who are content to let their flashy showmanship dictate the direction of their pictures, usually without the benefit of a dynamic plot to underline the whimsy. 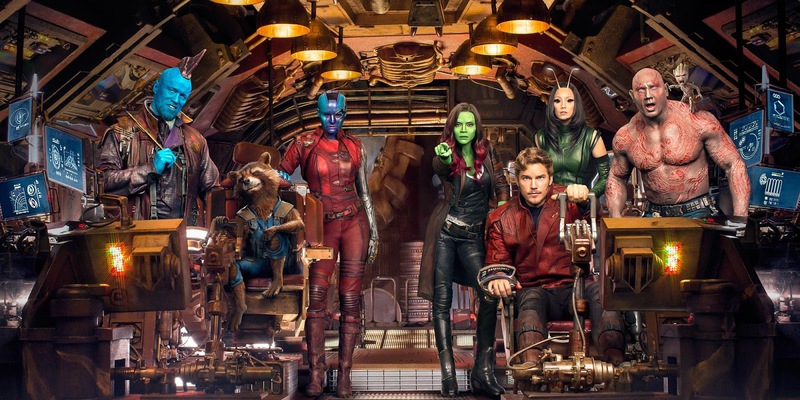 The first “Guardians” film excelled at accomplishing both, make no mistake, but now we must deal with this, a sequel that has charm and uproarious laughs but doesn’t seem at all interested in doing much else with the personalities it assembles. Part of that stems from the narrative obligation of sequels. There is a misguided need, I suspect, for writers of comic book films to double back on the exposition of its important players, especially when their origins seem intentionally vague. Take the Chris Pratt character as the latest target. Orphaned at a young age after losing his mother to a brain tumor, poor Peter Quill (aka Star-Lord) exists in a perpetual state of confusion about the origins of his absent father, and it persists as a glaring white elephant in the more heavier dialogue exchanges, as if every experience can be attributed to its painful stigma. That detail becomes the core directional arc of this outing, in which Quill and his fellow Guardians are intercepted in an ambush by a man claiming to be his dad. Their early interactions are made awkward by a certain disconnect in expectation, perhaps, but they are nominal by contrast to most lost relative formulas; rather than heated confrontations, they instead seem to bond methodically over the vast abilities they each possess, which go to inspire the obligatory uncertainties: what exactly is this man hiding, and what significance will this play as the movie moves them closer a predestined climax? And thus begins a journey to locales that are stirring on the senses, nourishing to the imagination and dreary in every way that deals with plot and action, save for a couple of brief chase sequences in the final act. Like the most experienced housekeeper, “Guardians of the Galaxy Vol. 2” moves through a checklist of familiar chores and rarely deviates from them, even when curiosity may be roused in the periphery. There’s something remarkable about that sense of discipline, I suppose, but what made the first film so distinctive in contrast to its more famous peers was the fluid nature of the ideas. As familiar as one might have been with the source, no one could anticipate such an adventure taking so many bold risks (I called that picture a “mad act of absurd genius”). But James Gunn, who wrote and directed both movies, seems to be possessed by a strange sense of studio enslavement this time around. Was he advised to play safe with this story for the sake of maintaining franchise momentum? Is he basically bridging this with the “Avengers” series, which has always been Marvel’s primary concern? Or was he so empowered by his screen personalities that he assumed their presence would enrich what is otherwise a straightforward yarn? Others on the team do not share in the afterglow of this discovery; some are ambivalent (the Drax character, played by Dave Bautista, becomes more enamored with Ego’s female sidekick than a commentator on parental epiphanies), and Gamora (Zoe Saldana) alters between supportive gestures and insistent warnings when she suspects more is at work behind the scenes (this while she struggles with her own strained sibling rivalry with Nebula, who has become a prisoner of the Guardians). 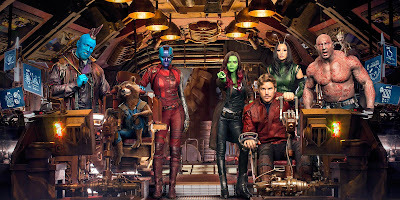 Rocket, meanwhile, stays behind to assist in the repair of their ship after it crashes onto a vegetated planet (don’t even get me started on the complete implausibility of this sequence), and when Yondu (Michael Rooker) comes back into the mix in search of Quill, a subplot about the angry aliens hiring his bounty hunters to apprehend the Guardians merges with the parentage angle just as the movie thrusts itself into the colorful final act. The actors do have fun with what they are given. Of course the Saldana character will serve the role as the voice of reason amongst a group of misfits, and of course the raccoon – effectively voiced by Cooper – will continuously aggravate the others as a means of inspiring reaction, but Pratt does some surprisingly good things with his performance. For one, the honest talks are a lot more sincere than you would expect, and there are two heated exchanges between he and his peers that are not done for humorist purposes; they actually carry underlying meaning. Ditto to Michael Rooker, whose tough exterior as Yondu reveals added dynamics, especially in the final exchanges. And Dave Bautista, naturally a wisecracker, takes his enthusiasm further by delivering both jokes and astute observations with a certain overbearing conviction. Among a small cluster of screen entertainers emerging from the shadows of professional wrestling, he is the one who shows the most promise as an actor. Possessing so many likeable players, however, also proves to be the film’s most glaring handicap. That’s because Gunn doesn’t feel obligated to give them very many interesting things to do here, other than comment sarcastically while they gaze at impressive new sights (Ego’s home planet is the film’s visual centerpiece) and then nervously wisecrack as those locales are systematically destroyed. Where is the dynamic journey we anticipate? Like many of the sequels now filling the Marvel cannon, “Guardians of the Galaxy Vol. 2” plays it safe when it ought to be leaping beyond the constraints of its foundation. 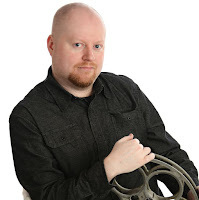 I am content to regard that with optimism for the sake of a movie review, perhaps, because I’m far fonder of these characters than I am of, say, the Avengers or the X-Men, who often require more thorough stories to rise above their primary visual distinctions. These are eccentrics that mean something to these stories, and I suspect in the most mediocre screenplay they would still find a way to amuse those who show up at the theater. If only they were being handled with a hand confident enough to challenge them with more than simple formula.